Combine all the liquid ingredients in a shaker. Add about 5 ice cubes and shake vigorously for 5–10 seconds. Strain into a highball glass filled with ice. 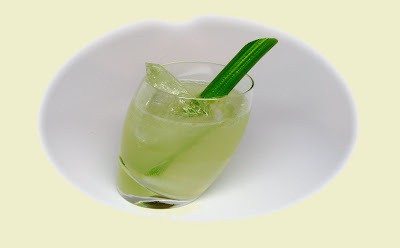 Garnish with the celery stick. The final version of mine didn't land as far away from the Loop Tonic as I had intended and would have liked. I was hoping I could cut out the simple and dial back the chartreuse and use the 10% agave in the crema and addition of aquavit to achieve a similar balance of sweetness and herbal complexity, but it needed further tweaking and this is where it led me. Other than the smoke from the mescal, it has only very subtle differences from the Loop, with perhaps a bit more richness. But that said, the Loop is great, and smoke is nice, so a smoky Loop is not so bad, just not as original as would be ideal.